Sometimes I can’t decide what kind of writer and scholar I am. I don’t mean in terms of the quality of my work (I have my own anxieties and suspicions there). No, I mean in terms of how I prefer to work. I used to think I was best on my own. I like conceiving of projects by myself, researching alone, certainly writing alone. I used to encourage students to collaborate, and admire people like Kate Ronald and Hepsi Roskelly who seemed to collaborate so productively and imaginatively, all the while thinking of how I wasn’t much in favor of it myself. Yet, having just finished work on an edited collection – a collaborative project with my dear friend, Amy Zenger that we just sent off to the publishers this week, I realize that I’m not the moody loner I sometimes imagine myself to be in my more flamboyantly romantic moments. And when I look back over the books and articles I’ve done in the last few years – and what projects I’m contemplating in the future – I see, along with my single-authored pieces, collaborative work with a number of different people. So clearly I do enjoy working with others. Part of what I’ve realized is that, sometimes, collaborations in which I’m invited to join a friend’s project, push me into new areas of ideas and scholarship, and pull me out of any tendency toward scholarly isolation. On top of that, they often force me to follow through with work I might otherwise leave aside. But this latest project also helped me remember that sometimes loosening my grip on an idea, actually helps it grow. I had the idea for New Media Literacies and Participatory Popular Culture Across Borders when I was writing Shimmering Literacies. 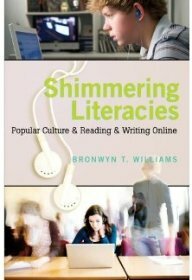 I realized while researching Shimmering Literacies that the students I was talking with and observing were often engaged with popular culture and other fans from countries around the world. Clearly, then, studying how participatory popular culture expanded and shaped literacy practices needed to look at students and texts beyond the U.S. Initially I thought this would be a chapter in Shimmering Literacies, but then also realized it was too big a topic for one chapter. In addition, I knew that it was a project I could not study adequately from Louisville, Kentucky, or understand fully from my perspective as a white, male from the U.S. If any project called out for the diverse voices of an edited collection, it was this. And I also knew I needed help to think about this project from someone who could broaden my thinking about texts and about crossing cultures, and thankfully Amy agreed to go in with me on the book. Yet even as I realized I wanted to bring in diverse perspectives around the world for the project, deep inside I can now also see that I still had a particular approach to the subject matter that I wanted to see in the book. Deep inside, I was still writing the missing chapter of Shimmering Literacies. The thing is, when you get an edited collection in which the contributors come from Australia, Nepal, Lebanon, the U.S. South Africa, Qatar, and Turkey, not only is the subject matter going to be varied, but so are the perspectives on the subject, on how to engage in research and scholarship, on theory, and on the writing itself. While I was fascinated by the material we were receiving, I realized I was becoming frustrated because it was not always conforming to my initial vision. This was not going to be the tightly focused book I had originally been thinking about. I was fortunate that Amy helped me get over myself. She helped me realize the power in having a more creative, varied, and expansive set of views of the focus of the book. She was right, of course, because that was the whole point of doing an edited collection. When I finally embraced that expansive conception of the book and realized the power of the different writing voices, different approaches to epistemology, different cultural contexts, I became even more excited about the collection we were putting together. It was a lesson that I need to keep in mind, not only for my scholarship, but also for my teaching – but more on that in a coming post. The collection itself also reflects the diverse opportunities and practices within participatory popular culture. As the contributors sent us their chapters, we found that their conceptions of participatory popular culture and literacy often challenged us to expand and rethink our own. What you will not find in this book is a lock-step set of definitions or scholarly approaches to this subject matter. The contributors not only represent a number of different countries, but also several different academic fields and approaches to research and scholarship. We encouraged these authors to demonstrate how their scholarly backgrounds and local cultural contexts led them to conceive of the issues involved with participatory popular culture across borders. The result is a book that ranges widely on this subject, but around every corner provides new and provocative ways of thinking about how people in different cultures work with and respond to the affordances of new media and popular culture. The effect is a book with intriguing juxtapositions, unusual connections, and often unexpected tensions and insights, all drawn together by the idea that literacy as a social practice is being changed by participatory popular culture in a transnational world. Letting go a bit, listening to others, and learning from them – I may need to be reminded about it now and again, but I am glad I can still learn to let it happen.